Have you ever seen a speaker who just seems to command the stage? Their very being demands attention, and oozes charisma, confidence and credibility. Want to know how that could be you? The read on.A few years ago I interviewed a selection of very talented and diverse speakers chosen because of their ability to demonstrate stage presence. I was curious to discover if they used any specific stage presence exercises to help them create this magnetic effect that instantly grabbed their audience’s attention. You see I believe that this ability to command an audience is a skill that that people learn. If I could learn their secret, then I could use it myself and share it with others. After analysing the transcripts of my interviews, it became clear that they did something similar when they appeared on stage. These speaking superstars understood that their speech or presentation started before they said anything. They knew about the power of silence, and so the first thing they did, when stepping into the spotlight, was to say nothing! In the beginning, standing silently will feel uncomfortable, but it get’s easier with practice. The second stage presence exercise they did was to relax. And they did this by taking a breath and recalling a place or a time, from their past, where they felt a particular quality of focused relaxation. The same type of relaxation that they wanted to experience here and now in front of their audience. It was as if they could, by remembering a past time, bring that particular quality into the present moment. As they relaxed, they deliberately looked out at their audience and smiled as they made eye contact with every part of their audience. Making eye contact is a powerful way to engage others. By doing so, you honour their presence and “see” them as they most important people in the room. Tip – In a small group, you can probably make personal eye contact with everyone. In a larger room, this becomes harder, but you can get the same effect by dividing the audience area into sections. Give each section an equal amount of eye contact in your opening and throughout the rest of your presentation. 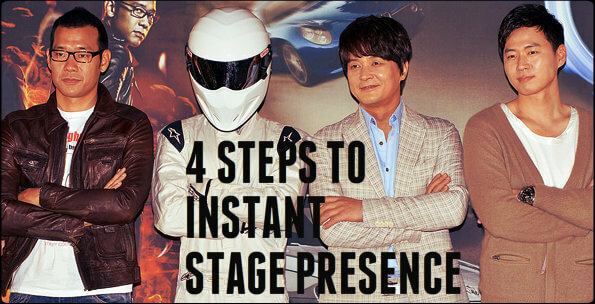 The final stage presence exercise involves connecting with your audience. All of my interviewees, as they looked out at their audience, silently welcomed everyone present into “their world” for however long they were going to be speaking. You may think these stage presence exercises sound a bit new age or even “Woo-Woo” but trust me, it works! Try it out for yourself and you will discover the benefits of this simple approach.